﻿Landing alligators is an exciting mix of hunting and fishing. ﻿﻿It’s a muggy, buggy afternoon in an East Texas marsh. While hungry alligators lurk nearby, the “gator boys” jump out of the boat to scramble around with rotten chicken — all part of the fun of gator hunting. It’s mid-September at the J.D. Murphree Wildlife Management Area near Port Arthur, time for the annual public alligator hunt. 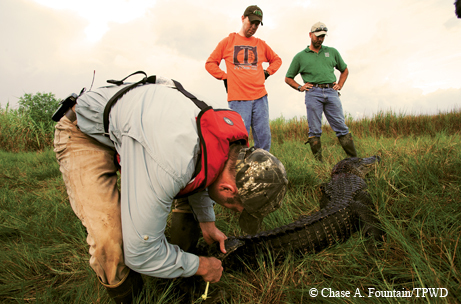 During September, 100 or so lucky hunters win the chance to come out to this wild and remote coastal marsh habitat to try to hook, tussle and land an American alligator. After a classroom orientation, long cane poles, 300-pound test line, some rather large hooks and that rotten chicken are loaded on to the boats. Hunting buddies Spencer Burke, Terry Scull and Scott Moore are off to look for just the right spot. 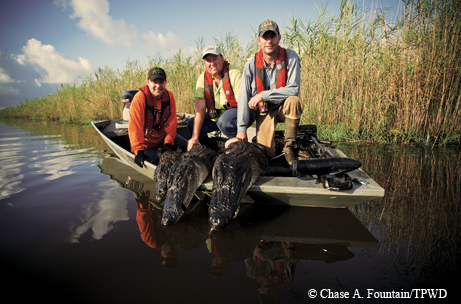 ﻿From left, Terry Scull, Scott Moore and Spencer Burke after their successful gator hunt. J.D. Murphree has some of the best gator habitat in Texas. It’s 24,000 acres of prime coastal marsh with meandering oxbows, canals, managed wetland impoundments and tidal lakes. First stop for the gator boys is the dead end of a long canal, deep in the marsh. The plan is to dangle a huge hook with chicken on it just above the water. Not just any chicken — this stuff is days old, baked in the hot Texas sun, rotten and rancid. The smell is so strong and powerful, it’s sure to attract any hungry gator from miles away. Burke is mighty particular when it comes to poultry placement. Positioning the cane pole deep in the levee bank is tough. Only first-time hunter Scull is brave enough (or perhaps naive enough) to actually get in the water to try to dig it in just right. The hook-and-line setup belongs to Moore, who’s happy to help, but only from the safety of the levee bank. Each hunter is allowed one setup, so the guys have two more spots to find. It all looks like prime gator habitat — runs sliding down off the levee banks, plenty of gators eyeballing the guys as they motor their boat through the canal. As the sun starts to fade on the day, they decide to place the other two sets within a mile of their first spot. Burke saves some rotten chicken marinade to chum up his setup. It’s been a rough five years for the J.D. Murphree Wildlife Man­agement Area. Hurricane Ike flooded the marsh with saltwater in 2008. That was followed by severe drought that contributed to poor habitat conditions through 2012. Peters says it’s taken until now for the damaged marsh grasses to recover, and the wildlife management area is now back to pre-Ike alligator numbers. Today, it has two to three alligators per acre. While outfitters charge thousands of dollars to take clients on a guided alligator hunt, the public hunt is far less costly. As part of the TPWD Public Hunt Drawing System, interested alligator hunters can choose from five wildlife management areas. (Murphree is by far the most popular choice.) Once a hunter has picked a WMA, the drawing entry fee is only $3. With persistence and a bit of luck, you can win one of the 100 or so permits handed out every year. Staff biologists say hunters have a 70 to 80 percent success rate at Murphree. It’s the next morning and the guys are up early, in the boat and ready to check those sets they put out the day before. Burke looks a little tired. ﻿﻿The hunters tag their catch. It’s overcast, and there’s a slight sprinkle as the boat heads out. The guys have been trying for years to win the drawing for this hunt. They actually all were selected in 2008, the year Hurricane Ike blew in. That storm canceled the public hunt, so for Scull, today’s chance to finally pull in a line and tussle with a gator has been a long time coming. “We’ve been drawing for eight years,” Scull says. Quickly, the gator boys head back up the bayou and into the canal, where they’d set up the rotten chicken bait the day before. The first stop is Moore’s setup. The bait and huge hook are no longer dangling over the water. Once out of the boat and safely on shore, Moore grabs tightly to the rope and holds on. Moore brings in an 8-footer, the largest of the gators caught by the gator boys that day. Nearby, Scull’s line is down, too. This time, the team works from inside the boat. As they get close, Scull grabs the line and slowly pulls on the rope. He ends up with a 6-footer. The last line to check is Burke’s. The gator-hunting veteran is confident his chummed chicken will bring in a big one. His gator ends up putting up the biggest fight. It is a tense situation: three tired hunters, two dead gators taking up most of the space in the boat, and out of the boat, one mean, angry alligator thrashing about.